Besides Ohio's early canals, railroads played and still play an important part of our commerce. 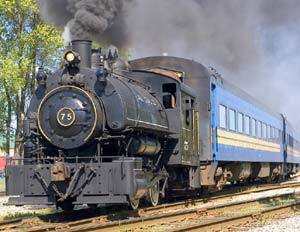 America's first regular commercial rail service was the Baltimore and Ohio Railroad which started in 1828. The Erie and Kalamazoo Railroad became the first regular rail service to operate from Ohio in 1837. By 1850 there was a rail boom in Ohio and by 1860 there was more railroad track laid in Ohio than any other state with almost 3000 miles of track connecting every major community in Ohio. While many might think that railroads are a thing of the past, today Ohio has more than 5,230 miles of working rail lines crossing the state. Most of the passenger lines have disappeared from Ohio, however, there are numerous scenic railroads that are in regular operation providing visitors an opportunity to experience what rail travel was like. 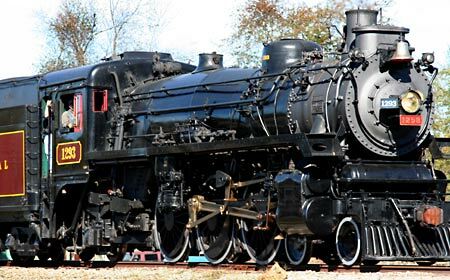 There are numerous railroad museums throughout the state, with the oldest one being the Ohio Railway Museum in Worthington, Ohio. Ohio has about 10 operating scenic railroads that provide periodic excursions through the country and that number is likely to grow. Just recently, the new Lodi Station Outlets has included a rail line to their shopping experience so shoppers can ride the rails and shop at the same location. The Cuyahoga Valley Scenic Railroad in Northeastern Ohio runs through the heart of Cuyahoga Valley National Park. Each trip is a different adventure filled with fun, excitement, natural beauty and historic sights. Spend a little or a lot of time exploring the things you like to see and do. You'll ride comfortably in vintage climate-controlled coaches built between 1939 and 1940. The coaches originally saw passenger service on the Seaboard and Santa Fe Railroads. Sit back, relax and enjoy a train ride to many exciting round trip destinations. It's all waiting for you. The train. The trips. The sights. The professional staff. Get on Board. Take a leisurely ride through the beautiful hills of southeastern Ohio. Enjoy the blooming dogwood trees in the spring, summertime fun, nature's spectacular fall foliage or a special winter ride with Santa. The Hocking Valley Scenic Railway offers diesel-powered rides through the beautiful, rolling hills of Southeastern Ohio aboard vintage equipment. The coaches used were built in 1927 for commuter service around Chicago and the primary diesel locomotive we use was built back in October of 1952. The coaches are heated in the winter. Regular service rides are held on weekends throughout the summer months from Memorial Day thru Labor Day and special rides at Christmas, Easter and a number of other special rides including a train robbery and a murder mystery ride. While visiting the Hocking Valley Scenic Railway, also visit the Nelsonville's Historic Square Arts District. During your trip you will see the beautiful countryside of southeastern Ohio while traveling the rails of the former Pennsylvania and B&O railroads. You’ll learn about the life, heritage, and culture of the coal miners that once worked underground in the many deep mines. Tickets are available at the Byesville depot, and are sold on a first-come first-serve basis. The 14 mile trip between Carrollton and Minerva highlights some of Carroll County's most beautiful scenery, while giving passengers a nostalgic look at rail travel along a working railroad. The train crosses the historic "Great Trail" of the late 1700's, which opened the western frontier to the settlers of our young nation. Passengers will pass villages, farmland and historic areas, and see beautiful forests and streams. All trips depart from the depot in Carrollton. The entire trip is approximately 28 miles in length and last 3 hours, with approximately a 1 hour layover in Minerva. Board the Blue Bird train at Waterville, Ohio for a 15 mile round trip on the tracks of the Toledo, Lake Erie & Western Railway and Museum, once part of the Cloverleaf Division of the Nickel Plate Road. The trip takes 60 minutes and includes a spectacular views as you travel across Northwest Ohio. Experience a nostalgic train ride on the Lebanon Mason Monroe (LM&M) Railroad through Warren County in Southwestern, Ohio. Every weekend the LM&M invites you to reminisce and capture moments with family. Walk through the train to the open-air gondola and listen to informative conductors describe railroad history and operation as well as offer a brief locomotive tour. Formerly known as the Lebanon and Turtlecreek Railway, the Lebanon Mason Monroe Railroad (LM&M) operates out of the beautiful Lebanon Station, in historic downtown Lebanon, Ohio. The train consists of a restored 1950s-era GP-7 diesel-electric locomotive, four open-window commuter coaches built in 1930, and a popular open-air gondola car on the rear of the train that allows passengers to enjoy panoramic views. Throughout the season, they often have other locomotives head up the tour trains like the above Flagg Coal Company #75 that took part in their "All Steamed Up!" excursions in June 2008. This is a small, industrial-type engine, with an 0-4-0 wheel configuration. Built in 1930 by Vulcan Iron Works in Wilkes-Barre, Pa., it was first purchased by the Flagg Coal Company in Pennsylvania, but then sold to the Solvay Process Quarry in New York, where it was used to push cart loads of rock. 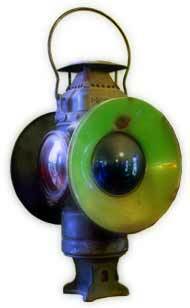 In 1954, it was purchased by railroad conservationist Dr. Stanley Groman. After Groman’s death in 1991, father and son team Byron and John Gramling purchased and restored the locomotive. Most Ohioans wanted railroads to connect communities that did not have access to canals. Also, most Ohio canals connected Lake Erie with the Ohio River, providing Ohioans with a relatively cheap means of transporting people and products from the northern part to the southern part of the state and vice versa. Many Ohioans hoped railroads would provide a quicker means of travel from eastern to western Ohio. In 1840, railroad companies had constructed only 40 miles of track in Ohio. By the turn of the Century 8,900 miles of rail had been built in Ohio.